Some might find this surprising but there are actually road rules in Jordan. Yes despite all that you’ve heard, read, or seen if you have visited the country there are road rules! I was taught these road rules the first time that I was told to get behind the wheel and drive. I had made the mistake of telling Atef that I had hired a car and driven around Morocco and his response was “well if you can drive in Morocco then you can drive in Jordan” and it was at this point that he pulled the car over and got out. If I wanted to get home then I was driving us. I asked was there anything I needed to know about driving in Jordan. He said that there were three things that I need to know. My lessons on Jordanian road rules was 10 seconds long! 3. 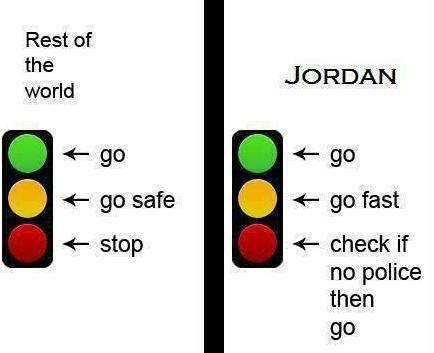 The golden rule of driving in Jordan. Give way to sheep (goats). Yes that’s right the rule that’s the rule above all others when you are driving in Jordan is sheep and goats have the right of way at all times. You might be driving down the highway doing 100 kms/hr but if there is a flock of sheep or goats that want to cross them you must stop and let them pass. If you hit a goat or sheep whilst driving them you as the driver are responsible and you have to pay the shepherd compensation. With the average goat or sheep being worth 200JD (about $285) this is an expensive exercise so it’s better for all involved for the driver to just give way. A friend posted this picture on her facebook the other day and it summerises the experience of driving in Jordan quite nicely. Refer to rule number 1 and 2! The first time that Mum and Dad came to Jordan this very thing happened. I’m not sure that Dad had fully noticed that that we were about to drive through a red light, but Mum certainly had and I could feel her stiffen next to me in the back seat. We were driving along the Dead Sea highway and going through a small village where there is one set of traffic lights. According to Atef (and Jordanians) these lights serve no purpose what so ever and as we approached the lights, which were red, with Atef still driving at about 70kpm with no intention of slowing down, I just casually said “and yes here you can see that this is a red light that we are driving through”. Atef just laughed. Welcome to the craziness of Jordan. This reminds me of my first ever day in Beirut. I had to take a cab and the driver cheerily informed me that the Brits were mad about their red lights, as he shot through a busy intersection on red!